Saracen Interiors complete more projects for Yum!! Saracen Interiors latest fast-track project was at Yum Restaurants International UK HQ in Surrey. 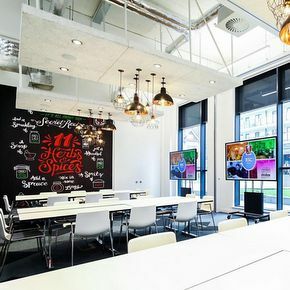 The work included HVAC alterations and modifications; the installation of five suspended acoustic ceiling rafts, feature pendant lights and LED spot lights; power and data works; carpet repair works and decoration of all meeting rooms. The project was finished within a fortnight, with most of the work completed out of office hours to minimise disruption for the Yum! team. Yum Restaurants International subsidiaries include KFC, Pizza Hut and Taco Bell, Saracen Interiors have developed working relationship with Yum! Over 13 years, providing a one stop shop of small works at various premises in the company’s property portfolio. Saracen work for Yum! around the UK has included fit out projects, office moves and churn, the sourcing and installation of furniture, power and data installations, garden and car park maintenance, gutter cleaning and external building pressure cleaning, along with general interior and exterior building repair work. Saracen Interiors recent clients include Coca-Cola Enterprises, CH2M, Yum Restaurants, Tata Communications, WYG, TE Connectivity, Loma Systems, Gray’s Inn Chambers, Libra Group, Creature of London, Aspect Property Group, First Property Group, Audatex, Athena Partners, Motofix, Flight Safety, Countrywide PLC, Knight Frank, Mitie Engineering, Pizza Hut, Redrow Homes, Thames Water, Toshiba, TAG Aviation, Viatel, BAE Systems, Sue Ryder Care, North Surrey Primary Care Trust, Royal Berkshire and Battle Hospital NHS Trust.